But it has generally not been an even fight through the centuries; no, the Hungarians and Slovaks have generally played the roles of hammer and nail, respectively. The Hungarians have definitely made their mark down through history as an enterprising, even “pushing” nation, from the very first invasion and conquest of the fertile Carpathian basis by the Magyar tribes out of Central Asia at the end of the ninth century, to the gaining of co-equal status within the (renamed) Austrian-Hungarian Empire. Prior to that it had been simply the Austrian (or Hapsburg) Empire, with German the official language and ethnic Germans/Austrians lording it over an imperial potpourri of Czechs, Poles, Slovaks, Jews, Ruthenians (i.e. Ukrainians), Romanians, Bosnians, Croatians – and Hungarians. But after a revolution in 1848 (finally crushed, but only with Russian help) and then unbearable pressure on the Austrian-Germans from the Prussian-Germans outside the Empire to the north, the Hungarians gained that desired co-equal status in 1867. Yes, they gained the right to make Hungarian the official language in their half of the Empire and to generally lord it in the same way themselves over the other nationalities residing on “their” territory. This happy arrangement (for the Austrians and Hungarians, that is) could have carried on for a long, long time, but the assassination of Franz Ferdinand and World War I generally suddenly intervened. Finally, you do have to give the Hungarians further credit for being an “activist” race in view of their resistance to Soviet Communist hegemony, namely the 1956 revolution which was both among the earliest anti-Soviet uprisings and the most violent. Why, those Hungarians showed themselves to be at least as bloody-minded – at least as “romantic” in the sense of stubborn resistance just for the sake of resistance – as even the Poles! And all of that seemingly came to nothing ultimately but long streams of refugees fleeing across the Austrian border in November, 1956, but that’s not really true. However, explaining why would necessitate a long story involving terms such as “goulash Communism” and a fellow by the name of János Kádár, a story we’re not going to get into here. Painting: Majális (meaning “picnic in May”) by Pál Szinyei Merse. Ironically, Rakovsky chooses this as the “typical” Hungarian painting because it is untypical when compared to what she admits is the “masterworks of Hungarian painting of the 19th century,” mostly to be found in Budapest’s National Museum, which are overwhelmingly dark and gloomy. Szinyei Merse’s (double family name) main appeal to Petrovsky is that he was often compared to the French impressionists. 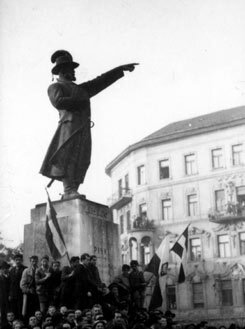 Photograph: Students stand before the statue of Jozsef Bem at Eötvös Loránd University in Budapest, in October, 1956. (Note: Trouw misspells “Eötvös Loránd,” putting a “t” at the end.) This is more like it: for here the anti-Soviet revolution is just getting under way, and the students are taking for their inspiration the Polish general (yes: Polish) who was the main commander of rebellious Hungarian troops during the 1848-49 revolution against the Austrians. Frankly, even though I lived in Budapest for a (short) while, I don’t recall whether that statue still stands; there was a lot of destruction happening right after this photo, you see, that could have put it in danger. Person: István Széchenyi. Correct answer, but any Hungarian would have answered the same. He’s known throughout the nation as the “Greatest Hungarian,” for his tremendous and multi-faceted contributions to the Hungarian language, and the advancement of technology and science in Hungary generally. Object: The Rubik’s cube, from 1975. Clever. A real ’70s throwback. Song: “I Left My Beautiful Fatherland,” no composer given. The point here is the prevalence of exile in the Hungarian historical experience, given all the uprisings and revolutions that have taken place there – not only 1848-49 and 1956, but also Rákoczi’s famous peasant rebellion of 1711, among others still. Food-dish: Dödölle, which is supposedly made out of potatoes, flour, onions, and sour cream. Never heard of it, even during my sojourn in Budapest. But Rakovsky adds that Dödölle is seen primarily as a children’s snack. Place: The main square in Sopron, Rakovsky’s home town. No way! Budapest dominates Hungary much more than even Prague dominates the Czech Republic, the way that Paris dominates France. Let me put it this way: Debrecen, Hungary’s second-biggest city (over in the eastern part of the country) is still so small that it boasts but two McDonalds! Clearly this is parochial favoritism at its worst! Hungary’s archetypical place really should have been someplace in Budapest, and there are plenty to choose from: Heros’ Square, for instance, or the National Museum, which leads us to the next (and last) entry . . . Event: March 15, 1848. As wrong as Rakovsky is with Sopron for “place,” she is just as right here. 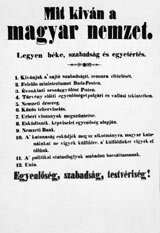 This date marked the outbreak of the Hungarian revolution against Hapsburg rule, sparked by the reading on the steps of the National Museum by poet Sándor Petõfi of his poem “Song of the People.” Naturally, March 15 is celebrated as a Hungarian national holiday to this very day.